Baked Oatmeal is something I’d heard about, but never made for a couple of reasons. First, I’d rather just eat oatmeal. Second, if I’m going to bake the oatmeal, why not just add flour and make it into delicious muffins? Well, I’ve changed my opinion and we are now enjoying “Baked Oatmeal Cups”! 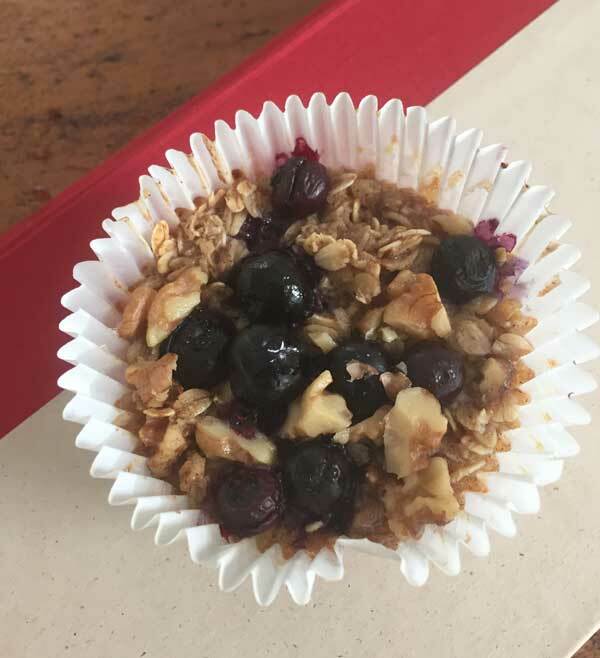 So what was the motivation for finally making Baked Oatmeal Cups? I saw them at Wegman’s for one thing, and if people like baked oatmeal enough to buy it in individual servings, then it must be good. That, plus I have more of an appreciation of the fact Baked Oatmeal doesn’t contain flour. It’s basically oats held together with eggs, milk and sugar — and some recipes leave out the sugar altogether! There are about a million ways to make Baked Oatmeal Cups, and once you make one batch you’ll probably want to experiment. Since we are kind of new to baked oatmeal, I started with a recipe called “Kids’ Favorite Baked Oatmeal” and made changes to fit our family’s tastes. Since my daughter rushes out the door every morning, individual portions were a must. And since I like to start the day with something slightly sweet, I kept the sugar and added berries and nuts. And finally, since there are only two of us eating the oatmeal and since I knew I’d want to experiment with more flavors, I kept the batch size small. 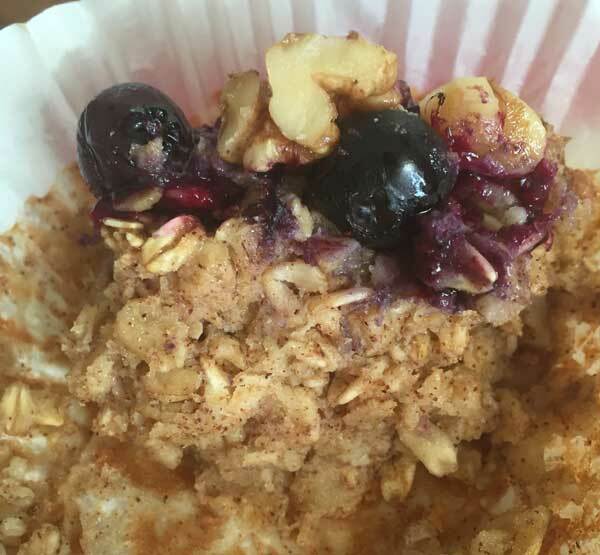 This recipe will give you six regular size Baked Oatmeal Cups or 4 jumbo size cups. Preheat oven to 375°. Grease 4 jumbo muffins cups (or 6 regular size) or line with paper liners. Mix the oats, sugar(s), baking powder, salt and cinnamon in a bowl. Whisk the egg, milk, applesauce, vanilla, and melted butter in a second bowl or large glass measuring cup. Add milk mixture to oat mixture and stir well, then stir in the walnuts. Divide oat mixture between the muffin cups. Sprinkle tops with blueberries. Bake at 375° for 15- 20 minutes or until muffins appear set.. While the muffins are still warm, gently loosen sides from muffin tin. Let cool to warm and carefully remove from muffin tin. Let cool completely, then put in a large freezer bag. Put the muffins in a freezer bag and store in freezer. The night before serving, take however many you need out of the freezer. Warm in the toaster the next morning. In my opinion, these actually taste better after being frozen, thawed and re-heated. 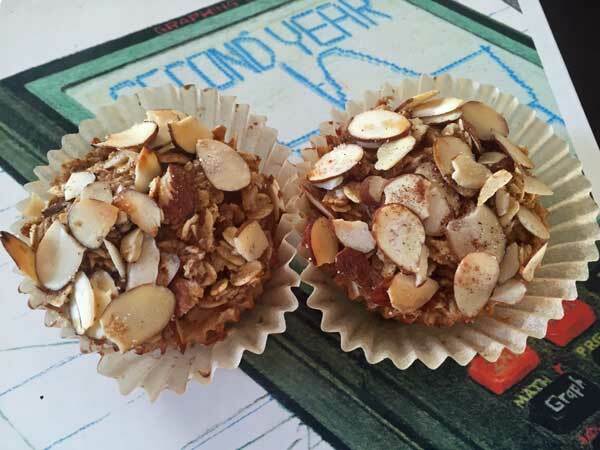 Do you have a favorite version of Baked Oatmeal Cups? Not yet, but I think that would be fine. You could probably just leave them at room temperature and not even bother warming them. Have you tried gently microwaving them? I need some portable food ideas but probably won’t have access to a toaster or toaster oven.